With its military engagement in Afghanistan, the German government is fighting two battles. One is 5,000km (3,000 miles) away in northern Afghanistan - against Taliban insurgents. The other is much closer to home - the battle for German public opinion. The Bundeswehr's military mission in Afghanistan is supremely unpopular with the German public. One recent survey indicates more than 70% of Germans want their country's troops to pull out. Another poll, released on Wednesday, suggests nearly 80% of Germans oppose sending more soldiers to take part in the Nato mission. Chancellor Angela Merkel knows that. But this week she decided to deploy another 500 troops to northern Afghanistan. An additional 350 soldiers will be placed on standby, to be sent if and when they are needed. Once the announcement was made, the government public relations machine whirred into action. The chancellor, the foreign and defence ministers all held televised press conferences, aiming to convince a sceptical public this was the best path to peace. 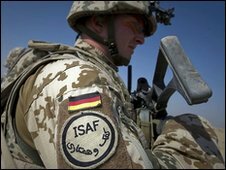 They reassured Germans the troops' main aim would be to train the Afghan army, not to take on the Taliban. The government will provide more money, too, to boost reconstruction and development projects, and to entice insurgents to lay down arms and reintegrate into society. "We need a solution that also implies civil components and development components," Defence Minister Karl-Theodor zu Guttenberg told me. "Of course troops play a significant role in Afghanistan. But we must ask ourselves what they are doing there? I think training must be the main issue." Chancellor Merkel calls this "a new strategy" and "a more defensive approach". But at a press conference in Berlin on Wednesday, she indicated German troops would still be in the firing line. "Up until now we have been operating as part of quick reaction forces, which have been based in our camps," the chancellor said. "Our new strategy is for our soldiers to operate outside the camps, training the Afghan army and working to prevent attacks before they can occur. Without this, we cannot protect the civilian population." Although Germany's foreign minister has said German troops could start to leave Afghanistan in 2011, Chancellor Merkel is refusing to announce any deadline. "It would be wrong to name a concrete date for the troops to leave," she said, "because we cannot predict what will happen and because we don't want to give an excuse to the Taliban to go quiet and then see them stage a large attack following a withdrawal." 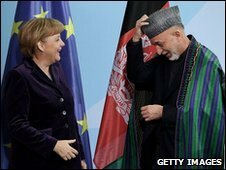 Standing beside Angela Merkel, the Afghan President Hamid Karzai urged the German public to stay the course. "I thank the German taxpayers for providing valuable assistance for Afghanistan," he said. "We in Afghanistan see the impact of that help. It is unfortunately not felt as much in Germany or in the UK. But we feel it. The cause for Afghanistan and for a safer world for freedom from extremism and terrorism is very much worth continuing with." But if the "new strategy" fails to bring peace and the conflict in Afghanistan continues, the public pressure on Chancellor Merkel to cut short Germany's military mission there will grow even more intense.